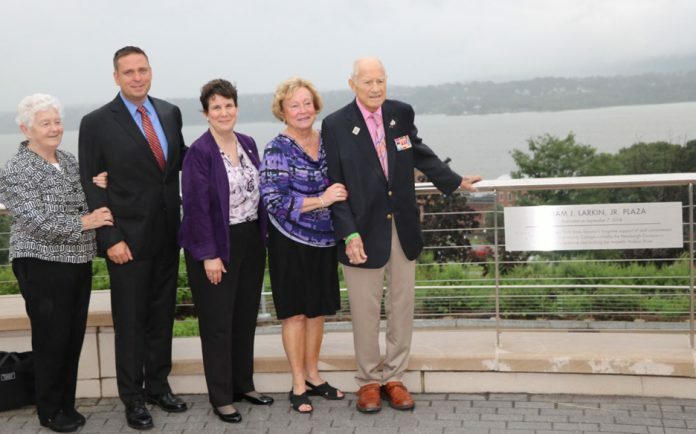 (From left to right): Sister Peggy Murphy, a member of the SUNY Orange Board of Trustees, Orange County Executive Steven M. Neuhaus, SUNY Orange President Kristine M. Young, Patricia Larkin and her husband, Senator Bill Larkin at “William J. Larkin Jr. Plaza” on Friday, September 7th. NEWBURGH – Orange County Executive Steven M. Neuhaus participated in a ceremony honoring Senator William Larkin at SUNY Orange in Newburgh on Friday. Senator Larkin will retire when his term ends in December. Orange County Sheriff Carl E. DuBois, Deputy County Executive Harry Porr and Legislators James O’Donnell and Paul Ruszkiewicz also attended the event. More than a decade ago, Larkin was among several key local proponents who believed access to higher education was critical to the City of Newburgh’s revitalization. Larkin and Newburgh philanthropist William Kaplan actively partnered with the College to lobby for state and county funding to help SUNY Orange expand its Newburgh Extension Center into a full-fledged branch campus. Senator William J. Larkin Jr. addresses the audience during a SUNY Orange ceremony on Sept. 7 in which the College named the central lawn on its Newburgh campus as the William J. Larkin Jr. Plaza. The naming honor was unanimously approved by the Colleges Board of Trustees in appreciation of the retiring Senators longtime support of SUNY Orange, particularly his work more than a decade ago to garner local and state support for creation of the campus. Kaplan pledged a sizable $10 million donation from his Kaplan Family Foundations while Larkin elicited needed support at the state level. Leaders from Orange County government were also integral supporters of the project. More recently, Larkin has supported the College’s BRIDGES program, which offers a post-secondary educational experience for students with intellectual, developmental, and autism spectrum disabilities. The program, available for students who meet basic eligibility requirements, provides an inclusive, community-based educational framework for students with intellectual disabilities (ID), developmental disabilities (DD) or autism spectrum disabilities (ASD). It began in 2015 and has received state funding support thanks to Larkin’s efforts. Larkin has spent 39 years in the New York State Legislature, serving in the Assembly from 1979-90. He was first elected to the New York State Senate in November of 1990. 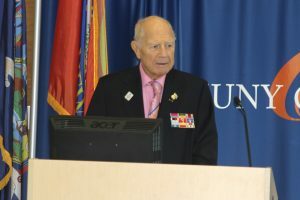 A veteran with 23 years of active military service, Senator Larkin retired from the United States Army in 1967 with the rank of Lieutenant Colonel. He served in many key positions, both in the United States and overseas, and saw combat in World War II while serving in the Philippines operation, and again in the Korean War. During his military service, Senator Larkin was the recipient of the Legion of Merit and seven Army Commendation Medals.